Why didn't Tell Me do the thing? If you've used Tell Me to initiate an action but found that action disabled, the most common reason is that you're not in quite the right place to take that action. 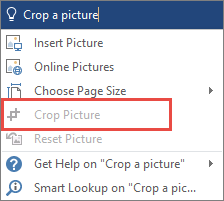 For example: In order to use the "Crop a Picture" feature you have to have a picture selected. To insert or delete a column in a table your cursor has to be in the table. In most cases to enable that feature or action you'll just need to return to your file for a moment and select the thing you wanted to take action on, or place your cursor in the right place in the file, to take the action you want. Once you've got the item selected, or cursor properly located, give Tell Me another try. Join the conversation in our Answers forums!